Home is very important to me. Sure, I like to get out into the world to learn and connect and get my extrovert on, but at my core, I am an earth mama who really appreciates a cozy space to help me feel grounded. After living many years in a 100-year-old cottage, we recently bought our first home. She sits on the shady side of a hill overlooking oak and eucalyptus trees, between the wisdom of the north and the promise of the east. As I’ve been settling into our new space (unpacking boxes, making frequent trips to the hardware store, and getting used to new noises at night), I’ve been feeling into how I can magically introduce myself to this new house on this new land. The energy of a home is really important. You can feel it so clearly in homes that feel dark or sad or even a bit haunted. You can also feel it in homes that feel safe, cozy, happy, and even a little bit witchy. First thing I did was whip out my phone, pull out the compass app, and mentally note the location of the 4 directions from our space. Knowing where the sun rises and sets in relation to where we live is a deeply grounded ancestral practice. Our first night in the house, we walked into every room and said hello, letting it know we lived here now and would be making it out home. We walked outside in our backyard (being dug up by landscapers) and said hello and let the land spirits know our promise to steward this land and infuse life and joy back into it. We’ve been taking time to notice the animals, birds, and critters coming along. We watch the tree across the street, which seems to be a meeting point for the local blackbirds and squirrels. We listen for coyote howling at night and the difference between the morning and afternoon birdsong. We have greeted every spider who seems to enjoy our downstairs bathroom and will continue to do so, because this work of introducing ourselves may take years. Transitions are rarely hasty (and the hasty ones rarely go well). ...and I don’t mean just washing the windows and vacuuming the dust left over from the wood floor installation. I mean cleaning the energy of the space. When we first moved into the space, it felt stagnant—like it lacked a feeling of aliveness. 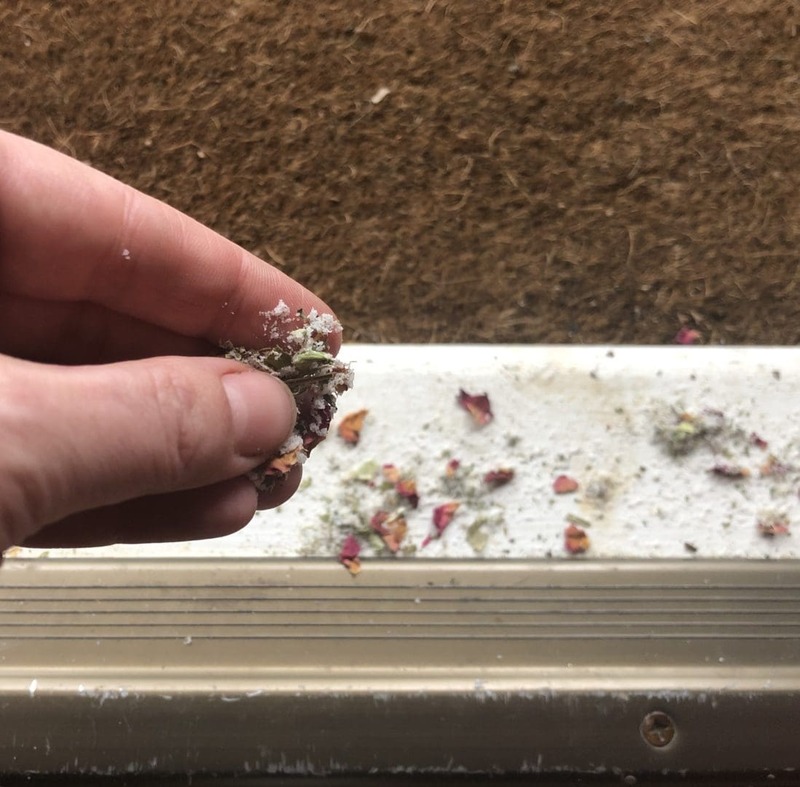 Ways to clean (or clear) a space are through smoke medicine (this is where you see a lot of folks using sage but I’ve been liking burning dried rosemary—an ancestrally protective plant—and lavender). You can also choose to use a broom over a vacuum because the sweeping motion is a very ancient practice of moving energy both out and in. As you’re sweeping, get clear on what you want out of your space (stagnant energy, seasonal sadness, that fight you picked over dirty dishes the other night) and what you want to sweep in (joy, prosperity, more laughter, orgasms). I leave a broom right by my front door as a reminder that I possess all the magic in me to sweep in and sweep out what is needed and not in my own home. I also highly recommend making a magical floor wash to mop your floors with. It brings the magic into the mundane of housework and infuses intention back into this ancient practice of cleansing a home. I posted a recipe for a floor wash in this blog post if you’re interested. You can also use noise to clear the energy of a space, using bells, drums, a shaker, or even some beans in a can. Walk around and tune into the parts of your space that need a good shake up with sound and movement. There are many ways to infuse protective qualities into your home. A lot of this has to do with what feels resonant to you. I highly recommend looking up folk methods of home protection of your ancestors. For instance, in Celtic tradition the goddess Brigid was known for protecting the home and hearth so to this day, folks will place a woven Brigid’s cross at the entrance to their home invoking the protection and love of this most beloved goddess. There are also many plants that have protective qualities. My favorite is rosemary. She’s strong, she’s spikey, and she grows so easily and vigorously where I live. Folk herbals share that one can place rosemary underneath your pillow to drive away nightmares or hang on your doorposts to keep thieves from entering the house. Salt is another protective ally. So many of our ancestors around the world strew salt at the entrances of their homes and sacred temples to ward off evil spirits and protect the sanctity of the space. 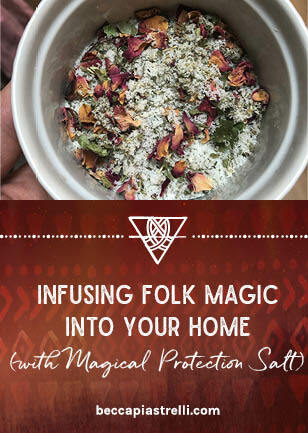 Craft your own magical salt to sprinkle near windows and doorways in your home! Raspberry: The brambles (branches) hung up at doors and windows for protection, also done at death so that spirit won’t re-enter the house once they’ve left. Cinnamon: The leaves of the cinnamon tree were woven into wreaths used to decorate Ancient Roman temples. When burned as an incense aids in healing and protection. If you’re interested in learning more about the magical properties of plants (from a European ancestral perspective) I recommend keeping Cunningham’s Encyclopedia of Magical Herbs around the house. It helps with everything from planning a garden to making a salad. I invite you to research what your people (your ancestors) used in their homes. Did they put wine, milk, and honey in a jar as an offering to the gods and goddesses? Did they hang garlic by the hearth to ward off evil? Do some digging and see how it works for you. Sweeping in orgasms – of course! You are so welcome! 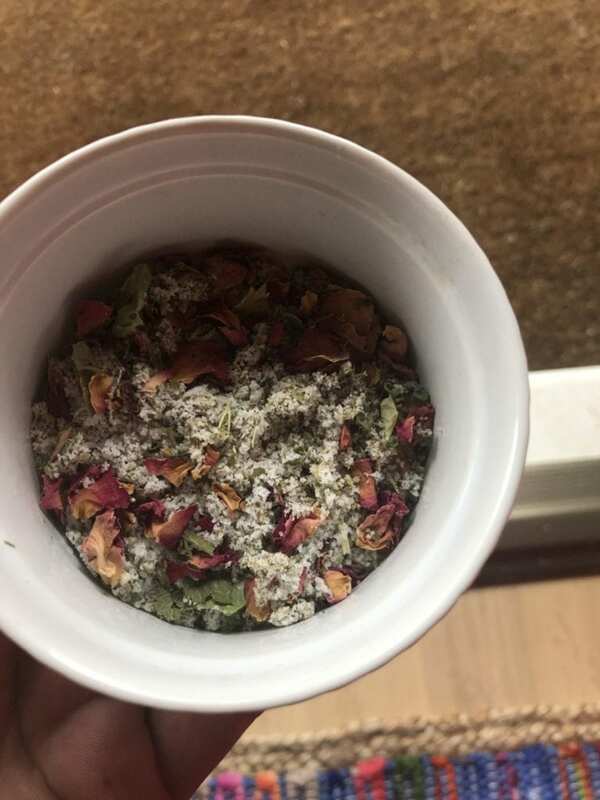 Envisioning your doorsteps strewn with gorgeous, magical salt! Beautiful practices Beccah. Thank you for doing all that you do to help us create our authentic spaces. I’m so glad it served, Teri!